After spending a considerable amount of time on addition and number bonds, we’re moving on to subtraction. The transition has been incredibly smooth, and I believe that is due in large part to our focus on number bonds and understanding the part-part-whole model. So rather than jumping into subtraction as a completely new concept (disconnected from anything we’ve previously done), we’re simply rearranging our number bonds. While we started with the concrete, hands-on representations, we’ve also made some wonderful connections as we’ve moved to more formal number sentences. 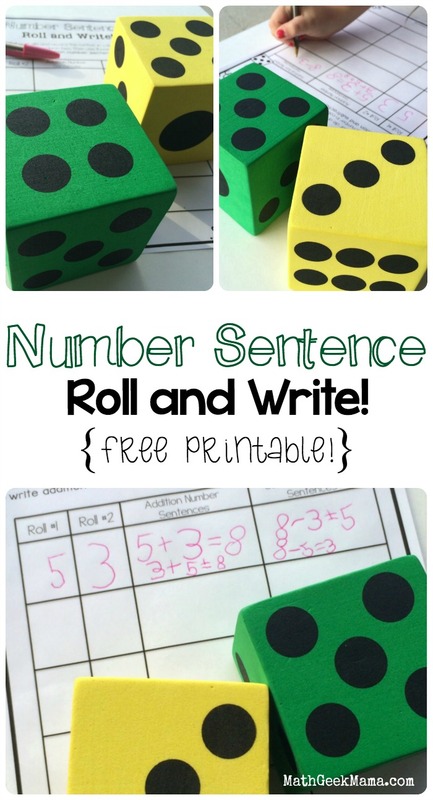 This Number Sentence Roll and Write activity has been so much fun, and is perfect practice for writing addition and subtraction number sentences! 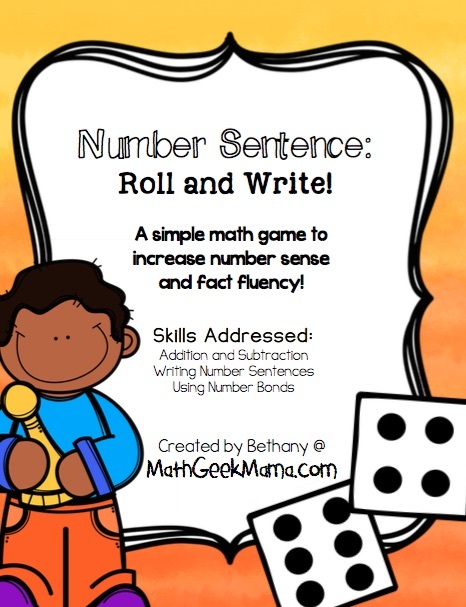 This activity has been helpful in forming connections between addition and subtraction, as well as a great introduction to formal math symbols. 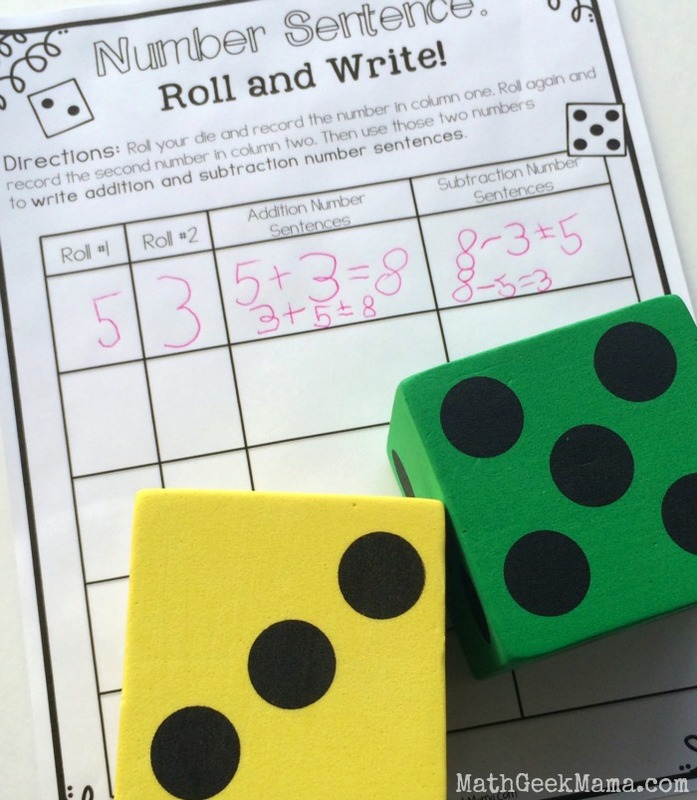 Math is a foreign language, and it is important to help kids understand that even though they may be able to show a concept with blocks or explain it in words, they also need to be able to write in math language. 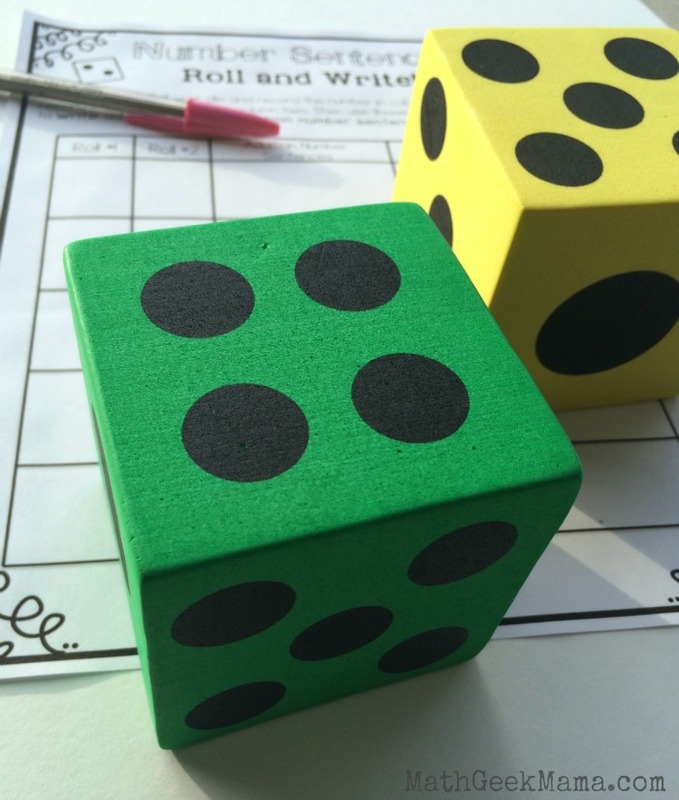 Using a die (or two), have the child roll a number. Record the first number on the page and then roll again. Record this number in the roll #2 column. Then, students use the two numbers as the “parts” to write two addition sentences (thus modeling the commutative property). The child then uses the “whole” found by adding to write two subtraction sentences as well. Then, they can roll again and continue until they complete the chart. It is important to note that before I had my daughter write this out on her own, we did a lot of hands-on play and math talk. So we would see, yes, three blocks and four blocks make a total of seven blocks. Then I would switch the blocks around and say, “Now you have four blocks and three blocks. Is it still seven?” Of course, the answer is yes. Then, I would take one set of blocks away and say, “What happens when I take away four blocks? How many are left?” and she would see that three blocks are left. I would then do the same with the three blocks to show that seven take away three is four. I then did the same thing with the dice. She would roll and determine the total, and then I would take away one of the dice to show that the “other part” is what remains. This was a helpful visual model of the number sentences. She was able to see and understand the concepts before I introduced the more formal math vocabulary and before I asked her to write it out with mathematical symbols. This activity has also been a great introduction to writing addition and subtraction number sentences, an important skill that we will continue to develop. Mathematics is a way to model the world around us, from these very basic addition and subtraction models to advanced Calculus, so understanding that each number and symbol in the “math sentence” represents a real thing and has meaning is an essential skill! What are some of your favorite ways to teach and model subtraction? Do you have any fun games to share? And if you’re teaching older kids, you may like this activity for multiplication and division! 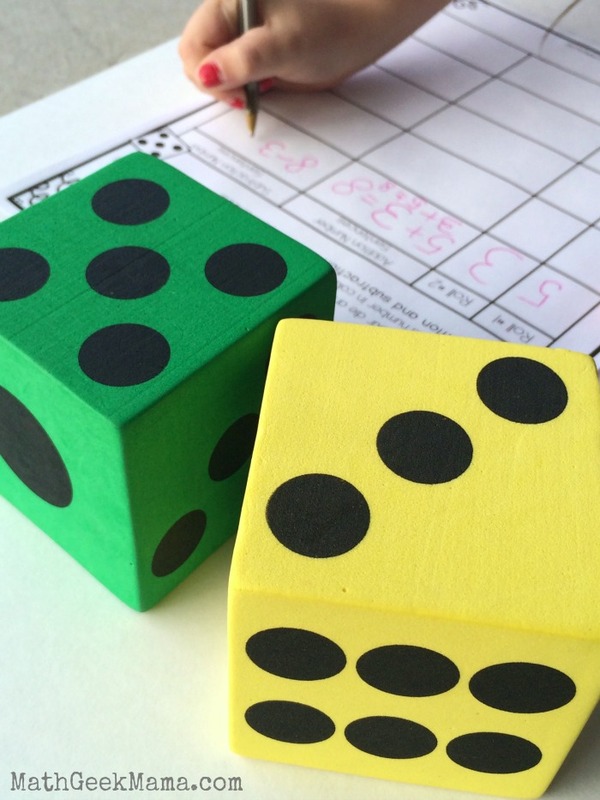 My kids love dice games, but do not like Math. I have a feeling this might get them to start enjoying it again. Thanks for this! I can see adapting this for multiplication and division problems. Thank you for sharing on Freebie Friday. Great freebie! I’d love to use those big dice like in your pictures! I’m sure the kiddos would love that! Thank you so much Christy!! 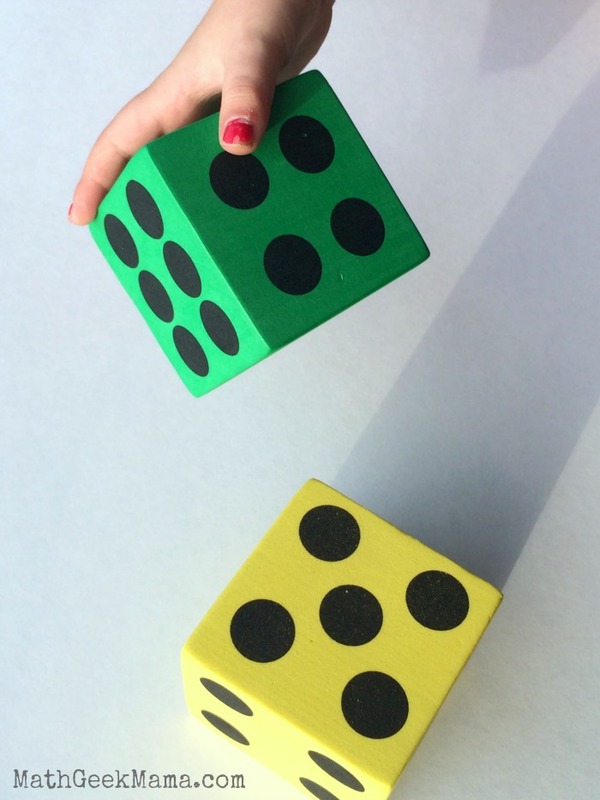 I hope you enjoy the giant dice, my daughter actually asked to do this activity again the next day because she had so much fun, and I really think it was mostly because of the dice, haha!